Mubychem Group, established in 1976, is the pioneer manufacturer of Calcium Stearate, Pharmaceutical, Fragrance & Flavor chemicals in India. Mubychem Group has several manufacturing facilities spread across Gujarat and Mumbai India and world wide contacts and toll manufacturers. We are exporting globally to countries like USA, Europe, UAE, South Africa, Tanzania, Kenya, Egypt, Nigeria, Uganda, Turkey, Mexico, Brazil, Chile, Argentina, Dubai, Indonesia etc. Mixture of calcium salts of different fatty acids consisting mainly of stearic octadecanoic acid [(C17H35COO)2Ca; M r 607] and palmitic (hexadecanoic) acid [(C15H31COO)2Ca; M r 550.9] with minor proportions of other fatty acids. sum of stearic acid and palmitic acid in the fatty acid fraction: minimum 90.0 per cent. Fine, white or almost white, crystalline powder. Practically insoluble in water and in ethanol (96 per cent). Minimum 53 °C, for the residue obtained in the preparation of solution S (see Tests). B. Acid value: 95 to 210. C. Examine the chromatograms obtained in the test for fatty acid composition. Results The retention times of the principal peaks in the chromatogram obtained with the test solution are approximately the same as those of the principal peaks in the chromatogram obtained with the reference solution. D. Neutralize 5 ml of solution S to red litmus paper R using strong sodium hydroxide solution: The solution gives reaction of calcium. To 5.0 g of Calcium Stearate add 50 ml of peroxide-free ether, 20 ml of dilute nitric acid and 20 ml of distilled water. Boil under a reflux condenser until dissolution is complete. Allow to cool. In a separating funnel, separate the aqueous layer and shake the ether layer with 2 quantities, each of 5 ml, of distilled water. Combine the aqueous layers, wash with 15 ml of peroxide-free ether and dilute the aqueous layer to 50 ml with distilled water (solution S). Evaporate the ether layer to dryness and dry the residue at 100-105 °C. Keep the residue for identification tests A and B. To 1.0 g Calcium Stearate add 20 ml of carbon dioxide-free water and boil for 1 min with continuous shaking. Cool and filter. To 10 ml of the filtrate add 0.05 ml of bromothymol blue solution. Not more than 0.5 ml of 0.01 M hydrochloric acid or 0.01 M sodium hydroxide is required to change the colour of the indicator. Maximum 6.0 per cent, determined on 1.000 g by drying in an oven at 105 °C. Total viable aerobic count (2.6.12) not more than 103 micro-organisms per gram determined by plate count. It complies with the test for Escherichia coli. To be done and to pass the limits as stated above. 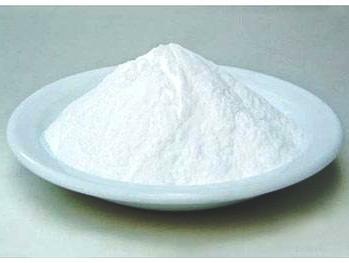 Calcium Stearate is a compound of calcium with a mixture of solid organic acids obtained from fats and consists chiefly of variable proportions of calcium stearate and calcium palmitate. It contains the equivalent of not less than 9.0 percent and not more than 10.5 percent of calcium oxide (CaO). A: Heat 1 g Calcium Stearate with a mixture of 25 mL of water and 5 mL of hydrochloric acid: fatty acids are liberated and appear as an oily layer floating on the surface of the liquid. The water layer responds to the tests for Calcium. B: Mix 25 g Calcium Stearate with 200 mL of hot water, add 60 mL of 2 N sulfuric acid, and heat the mixture, with frequent stirring, until the separated fatty acid layer is clear. Wash the fatty acids with boiling water until free from sulfate, collect them in a small beaker, and warm on a steam bath until the water has separated and the fatty acids are clear. Allow the acids to cool, pour off the water layer, melt the acids, filter into a dry beaker, and dry at 105 for 20 minutes: the fatty acids so obtained congeal at a temperature not below 54. Loss on drying— Dry it at 105 to constant weight, using 2-hour increments of heating: it loses not more than 4.0% of its weight. Heavy metals— The limit is 10 µg per g.
Assay— Boil about 1.2 g of Calcium Stearate, accurately weighed, with 50 mL of 1 N sulfuric acid for about 3 hours using a watch glass cover to avoid splattering, or until the separated fatty acid layer is clear, adding water, if necessary, to maintain the original volume. [NOTE—Stirring may be helpful in obtaining a clear layer and decreasing extraction time.] Cool, filter, and wash the filter and the flask thoroughly with water until the last washing is not acid to litmus. Neutralize the filtrate with 1 N sodium hydroxide to litmus. While stirring, preferably with a magnetic stirrer, titrate with 0.05 M edetate disodium VS as follows. Add about 30 mL from a 50-mL burette, then add 15 mL of 1 N sodium hydroxide and 300 mg of hydroxy naphthol blue, and continue the titration to a blue endpoint. Each mL of 0.05 M edetate disodium is equivalent to 2.804 mg of CaO. Calcium Stearate occurs as a fine, white to yellow-white, bulky powder. It is a compound of calcium with a mixture of solid organic acids obtained from edible sources and consists chiefly of variable proportions of calcium stearate and calcium palmitate. It is unctuous and free from grittiness. It is insoluble in water, in alcohol, and in ether. A. Heat 1 g of Calcium Stearate with a mixture of 25 mL of water and 5 mL of hydrochloric acid. Fatty acids are liberated, floating as an oily layer on the surface of the liquid. The water layer gives positive tests for Calcium. Assay: Not less than 9.0% and not more than 10.5% of CaO, calculated on the dried basis. Free Fatty Acids (as stearic acid): Not more than 3.0%.